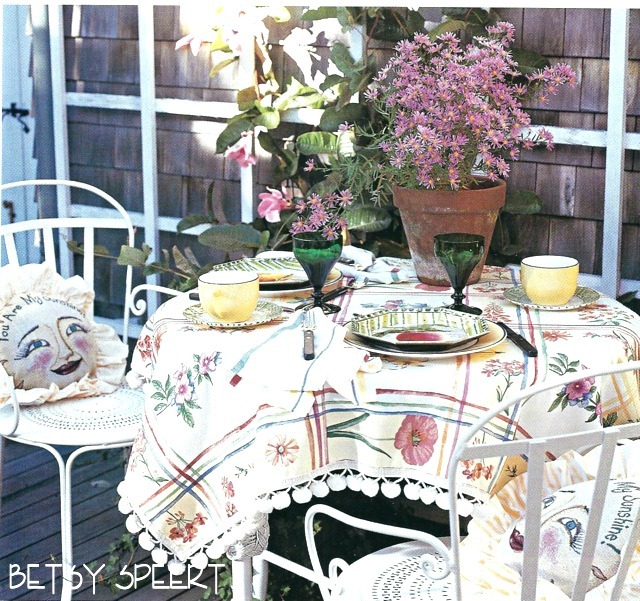 This post will finish up my wanderings down memory lane visiting the job I did for the Newhouses on Martha's Vineyard. 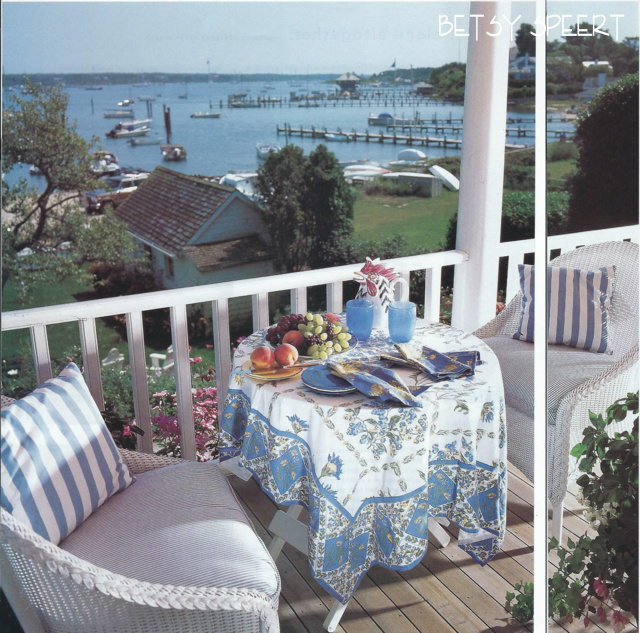 Separating the main house from the guest house was a deck that was the same level as the floors in both houses so that Wynn Newhouse, who used a wheelchair, could easily enter and exit both residences. I wrote about the deck last week, and decorated it in a way that would relate to the guesthouse, as its double French doors opened onto the private outside seating area. I repeated the wicker details from the deck inside in the living room. 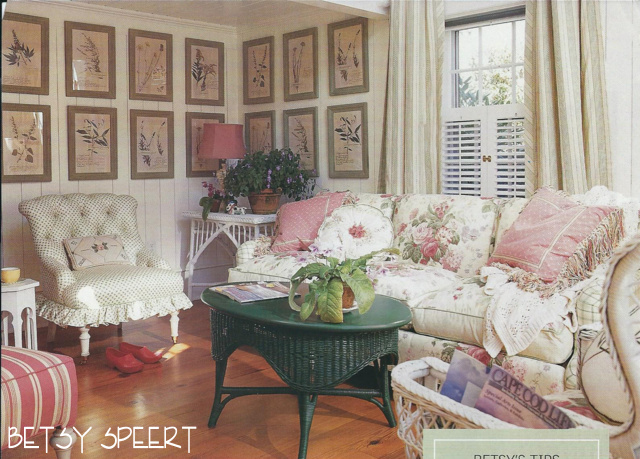 Since I decorated this house for a story for Country Garden Magazine, I used lots of flower patterns and prints throughout the downstairs. It was a good deal for the Newhouses, as whatever I used that they liked, they could get at my cost. 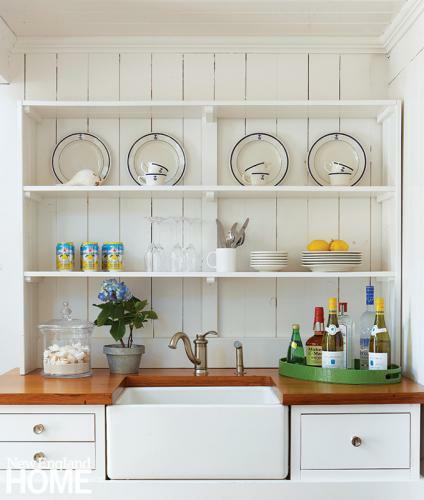 to fill up shelves and table tops when doing a shoot. As you can see in these pictures, I didn't lack for LOTS of stuff. I decorated everything using catalogs. This was before the days of shopping online. Boy, it would have been so easy now. 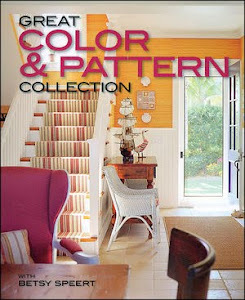 Ballard Design was my go to for the botanical prints. They didn't have quite enough individual prints, so I had to double up on some. Since it was for a story, and not a client, I figured no one would notice. Imagine my surprise when I saw that they are still hanging on the walls 25 years later! This was in the days before I designed fabric and actually had time on my hands to needlepoint. I designed and made the round pillow with the no weeds message. this was a looooong time ago, and I'm an old fart. The black metal table to the right of the sofa was an antique bar cart with small wheels I convinced June, my office manager and besty, to buy when we were out trolling the junky stores. It ended up being perfect for her family room. Well, I made her let me use it for the shoot. 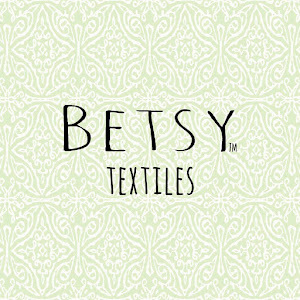 (Notice that besty and Betsy are very similar in spelling???? This house had been the garage for the main house. Les Brown, the architect I've been saddled with for most of my adult life that I work with, designed it to be a one bedroom with living room, wet bar and loft. I wanted the walls to be planks of wood, and had to spend some time with the carpenters to show them what I meant. THEY WANTED THE BOARDS TO BE TIGHT TOGETHER!!!! They didn't understand the beauty of cracks!!!!! So, we had to choose a nail that was the width of the cracks I wanted, that they could use as a spacer. I had learned my lesson on a little house I redid in New Hampshire. The carpenter was very proud of how he could make the would ceiling look like it was a solid piece of wood, that ended up resembling plywood, in my less than humble opinion. I WANTED TO SEE THEM RIGHT AWAY!!!! What's the point of using boards if they end up looking like plywood????? that's my take on that!!! I added a flirty skirt to the small tufted chair and another needle point pillow, designed and sewn by MOI!!! It says "sit down right here" the words are in the corners. I just ran and got the pillow and took a shot using my iPad, 'cuz I be too lazy to get out my camera. anyway, here's the pillow in all its glory, laying on my desk, as I type! I made the pillow out of left over yarn I had, which is why it's a little of this and a little of that. The white wicker table in the back corner was an antique that we found in a local store, we borrowed some things from local merchants for the shoot. OY, OY, OY, who can remember????? I went a little trim crazy on the pillows. I loved the multicolored yarn fringe on the pink ones. I still think this cabbage rose fabric is beautiful. It's so fresh in its coloring. At the time of this story, which was in the late 90's, I had just started seeing multiple fabrics used on one piece of upholstery. So, I used a gazillion on the sofa. 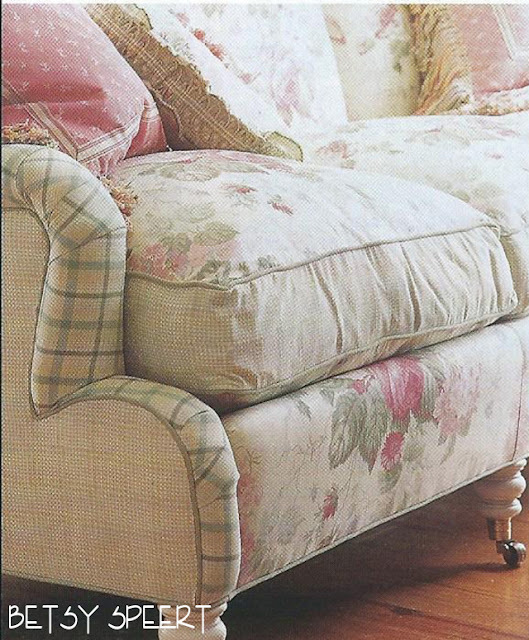 The floral is on the tops and bottoms of the cushions, as well as the inside body of the sofa. The inside arms are a large plaid. The outside arms and the boxing on the cushions are a smaller plaid. And then, of course, there's the two more fabrics plus trims on the toss pillows. 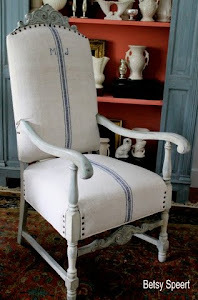 Then there's the small all over pattern of the small button chair and a couple more patterns on the little footstool and the larger striped ottoman. Across from the sofa was the potting bench. 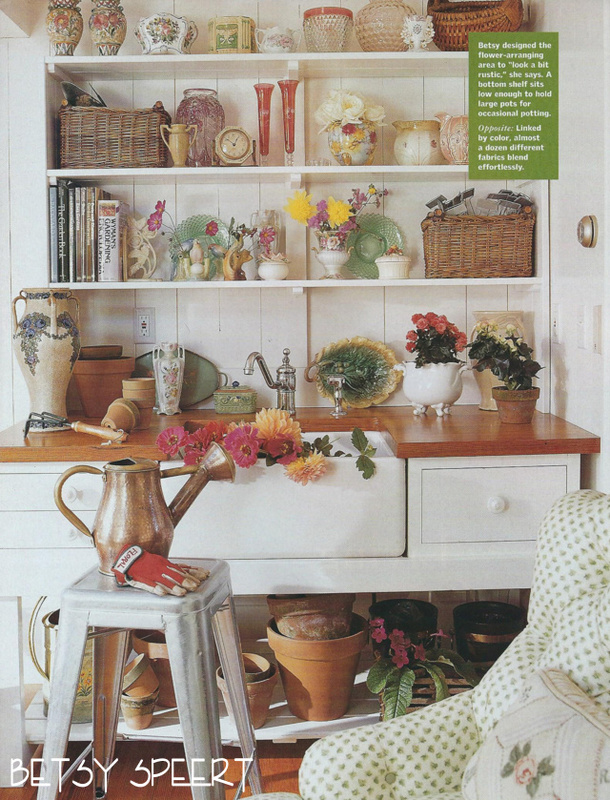 Catherine Newhouse was adamant that she wanted a potting bench. SO SHE GOT A POTTING BENCH!!! 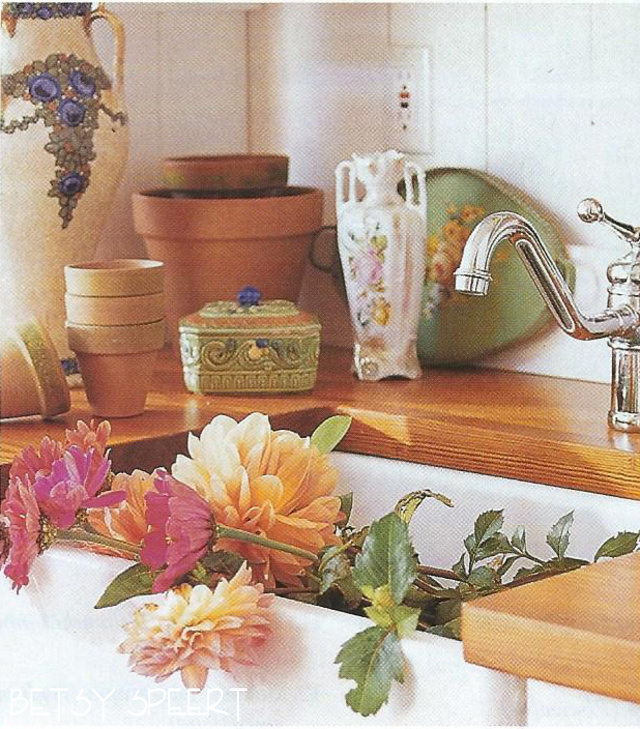 I designed it to hold a farmer's sink with a faucet that looked sorta like a pump handle, all in keeping with the theme of the POTTING BENCH!!!!! All the accessories on THE POTTING BENCH I brought from my home. I wanted it to look like there were tons of vases and pots, ready to handle any cut flowers or plants needing some care. I brought my zinc plant labels that I still use today in my vegetable garden. I used another basket to hold the trowels and rakes for gardening. 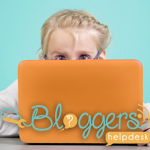 Below are three shots from today that I found on Vignette Design Blog by Delores Arabian. It now can be rented for a few weeks in the summer, and she stayed there! 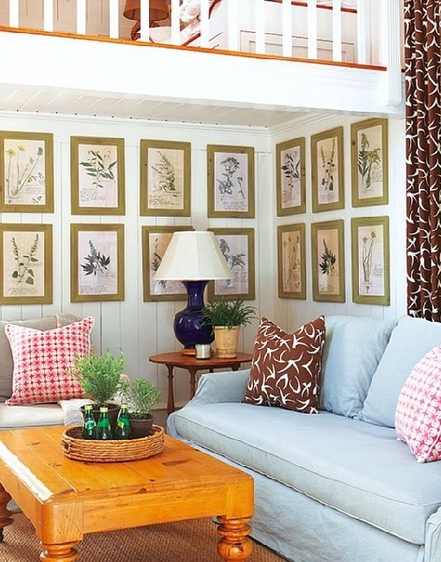 The present owners kept the floral prints on the wall and moved the living room table from the main house into this little guest house. I wonder if they noticed that some of the botanical prints repeat????? This is how the POTTING BENCH looks today. It's being used as a bar in the guest house, which is a wonderful use for my little creation. I noticed that they changed the knobs. The wooden countertop has held up well over the years!!!!! AND THE CRACKS IN THE BOARDS LOOK STELLAR!!!!! The outdoor deck is still pretty with the climbing roses flowering. Non of the furniture I used for the photo shoot was kept. next week it's on to something else my tiny mind will unearth. The Newhouse's vacation home had a garage on the street separated from the house by an unsightly patio. this "terrace" and the house next door. came up with a solution that would have been brilliant if I was the one to think of it!!!!! Les designed a deck that was the same height as the entrances to both buildings. and the floors of both houses. so you have to be vigilante in snow removal. I guess you're rich enough to have the snow cleared from your deck if you want to get out the door. I have to hand it to Les for the way he was able to make this area one of the nicest's aspects of the house. leaving just a couple of feet between the deck and the fence. But since this was a deck and not a terrace, it was possible to plant rose bushes along the fence as the roots had plenty of good dirt under the deck. Tons of perennials were used to fill in the rest of the beds, creating a lush and colorful border. Annuals were placed among them in pots that didn't show as the deck was higher than the ground and hid the pot. If they became scraggly and unsightly, they were just swapped out for newer fresher flowers. with no work for the lazy!!!!! 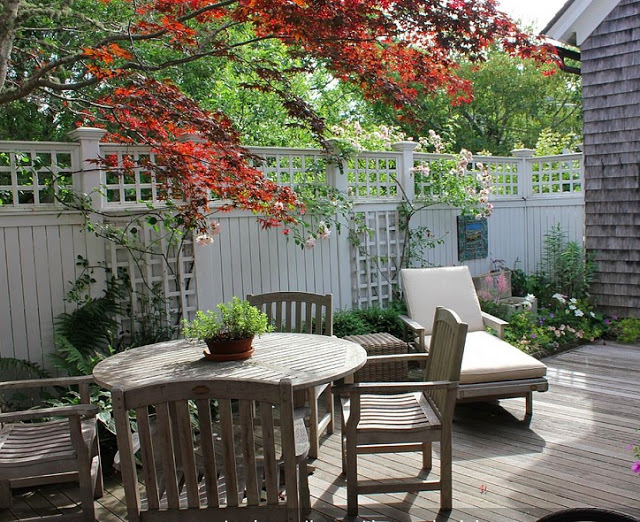 Trellises were mounted at intervals along the fence to support the climbing roses that would eventually run along the top, forming a beautiful visual barrier between this secret outdoor space and the neighbors larger, taller home. A square cutout in the deck allowed the planting of a pretty Japanese maple to supply some shade in the hotter months. 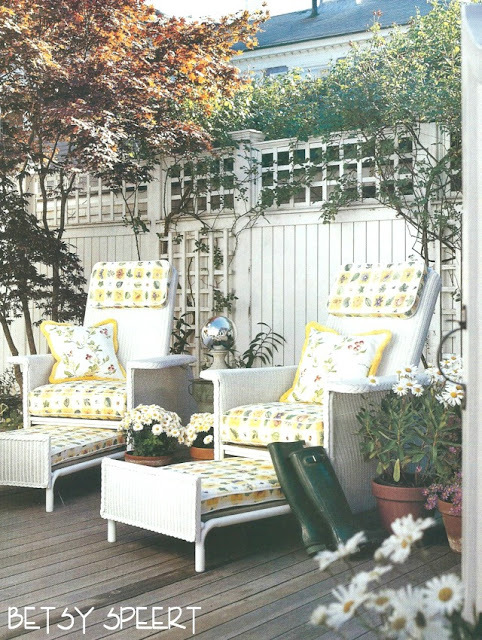 Country Garden Magazine had me produce a story for them incorporating the Newhouses deck and guesthouse. So, these pictures are from that photo shoot. anything that I chose that they liked, they could get at my cost, so it was a win-win for everyone. and the Newhouses got a good deal!!!!! where June, my trusty office manager-assistant-best friend and I unpacked the crates and boxes and set up for the photo shoot. The chaises I chose for the deck were from Lloyd Flanders, but I believe they are no longer made. but the pull out foot rests weren't that comfortable. IT DIDN'T MATTER IF IT FELT GOOD AS LONG AS IT LOOKED GOOD!!!!! The fabrics chosen were all for outdoor use. Since this was Soooooooooo long ago, I don't know it any of them are still available. For designing this spread, I had the best time pouring over catalogs, since this was a retail story and everything was to be easily purchased by the readers. My dad used to sing that song to me when I was little. go sing silly songs to your kids. 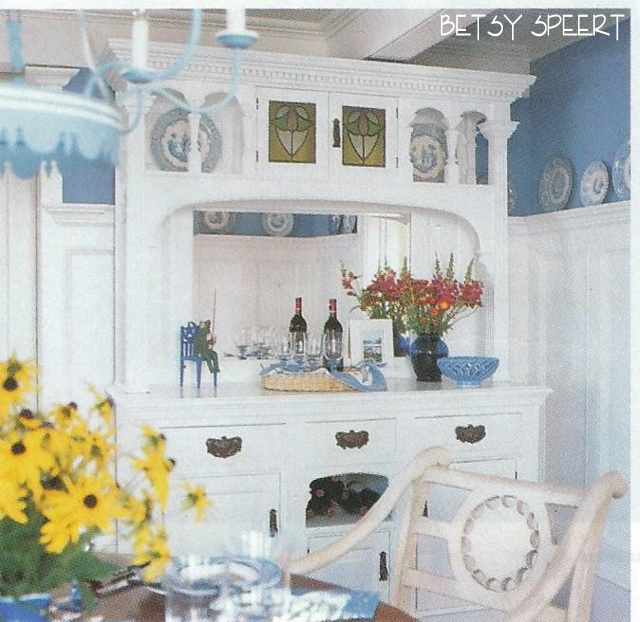 Today I'll finish up with the main house that I did for Wynn and Catherine Newhouse on Martha's Vineyard. Next week we'll go look at the guest house. due to the fact that Wynn used a wheel chair. 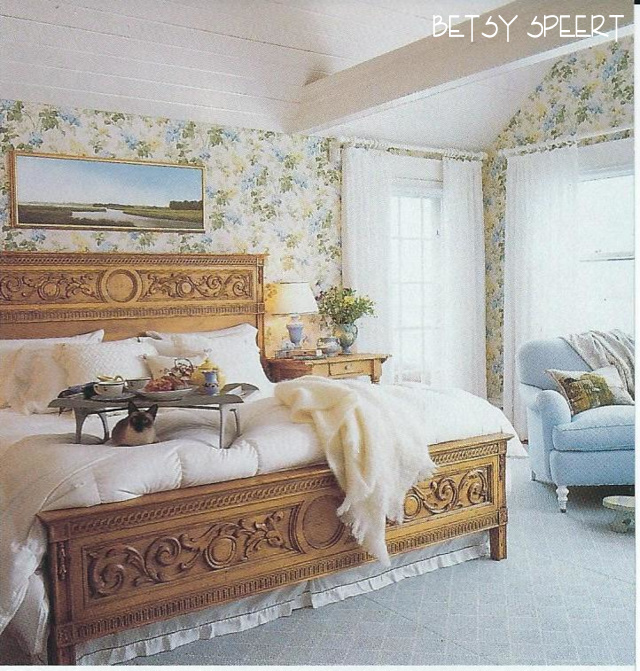 So when it came to designing the master bedroom, I had to take that into account when choosing a bed. It had to be the right height so that he could transfer onto and off of the bed into his wheel chair. We found a beautiful one that was waxed pine from Spain, but the standard mattress height would have been way too far off the ground. Wynn and I spent some time figuring out what he liked best. 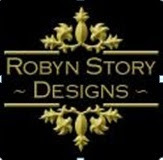 The advantage of designing for a specific disabled person, is that you can tailor the furniture and fixtures to him. The furniture factory was willing to accommodate my custom dimensions, but of course it took longer to get the bed. This was in the days that waxed pine was all the rage and everything that had been painted was stripped and waxed. I had to work on Catherine to get her to approve the wallpaper. She was worried it would be too busy. I thought it would make a pretty soft cocoon, counteracting the cathedral ceiling, which can sometimes make a room feel less than cozy. This house may have been the first time I ever used sheers as the primary draperies on a window. Remember, this was a gazillion years ago, and up until then I had only seen them as a secondary treatment to leave closed over the window all the time. The painting over the bed was one that the Newhouses chose in a local gallery. 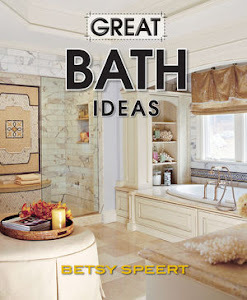 In the master bath, I designed a sink that allowed Wynn to roll under the counter. I drew funky looking brackets that a local woodworker made. 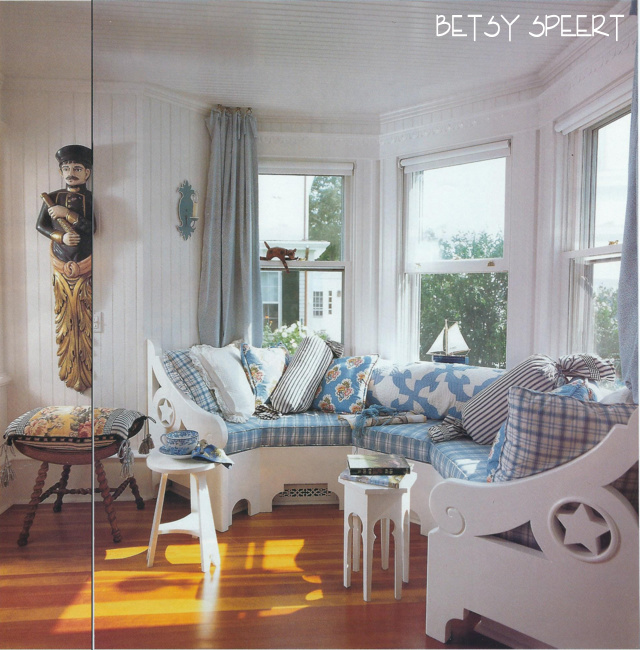 We found an antique Victorian curved top mirror that fit the space, and I had it painted white. The towel bars had to be all at a low height, so Wynn could reach them. The shower was a roll in stall where he could transfer onto the seat inside. 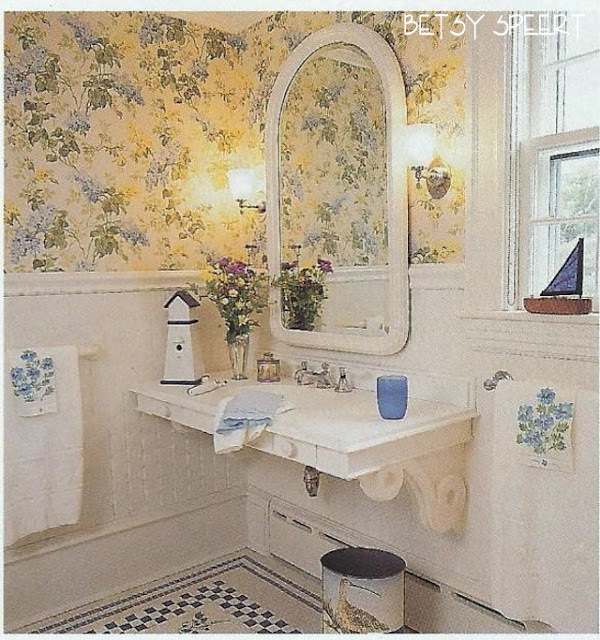 I continued the master bedroom wallpaper into the bathroom. 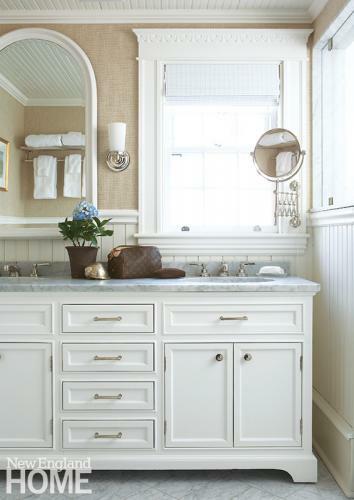 This is something I always try to do to unite a master suite, even though this bathroom wasn't attached to the master bedroom, but off the hallway as this was an old house. I stole some more pictures from Vignette Design , a wonderful blog that wrote about the way this house house looks today with new owners. 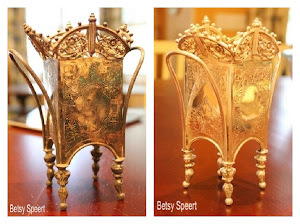 It sometimes is for rent, and Delores from Vignette Design stayed there with no idea that I was the original designer. Boy, what a small world! Below is a picture of the bathroom in it's current life. The mirror was kept, but the scones changed and they were able to add a long vanity that looks like it's from Restoration Hardware. I see that the floors been changed to what looks like 12 inch carrara marble tiles. I use small tiles in a bathroom due to the danger of slipping on a wet floor. The advantage of a small tile is that the grout lines will interrupt your slide. They used a trick that I have employed in bathrooms when the vanity extends under a window so there is no way to have a mirror over the second sink. A shaving mirror on a swing arm is a fun way to fix that problem. 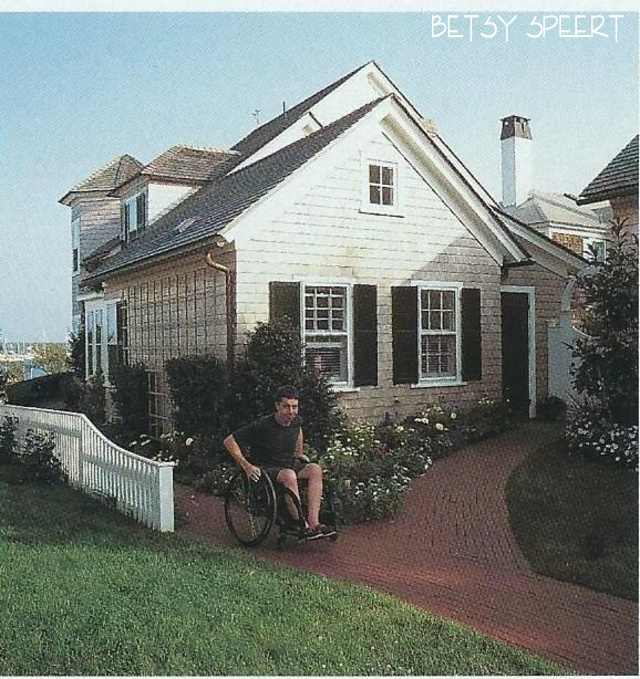 Les Brown, the architect that I forced to work included in this project, worked with the landscape architect and the builder to devise the brick paths that were actually ramps for Wynn to access the house with no steps or thresholds to deal with. Wynn used a super light wheel chair, and none of us could ever keep up with him. 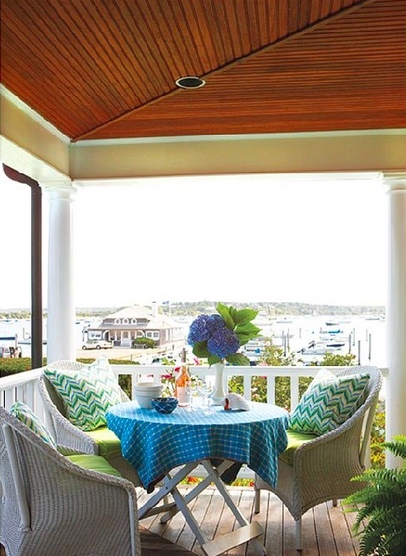 I chose white outdoor wicker chairs with a little table for the porch overlooking the harbor. Wynn and Catherine loved to see the activity in the water as both of them were avid boaters. Below is a shot of the porch today. They still have the same chairs and table but have refreshed everything with new cushions and pillows. 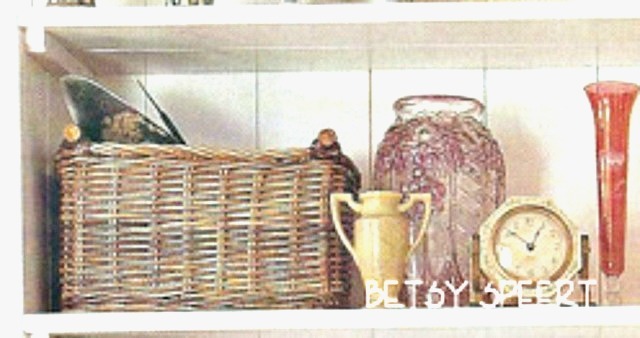 In Delores's shots of the house now, it's fun to see what is still being used that was purchased so long ago. They kept the boat figurehead that we had hung in the front hall. Below is a shot of my work. The seat cushion has remained with the figurehead. 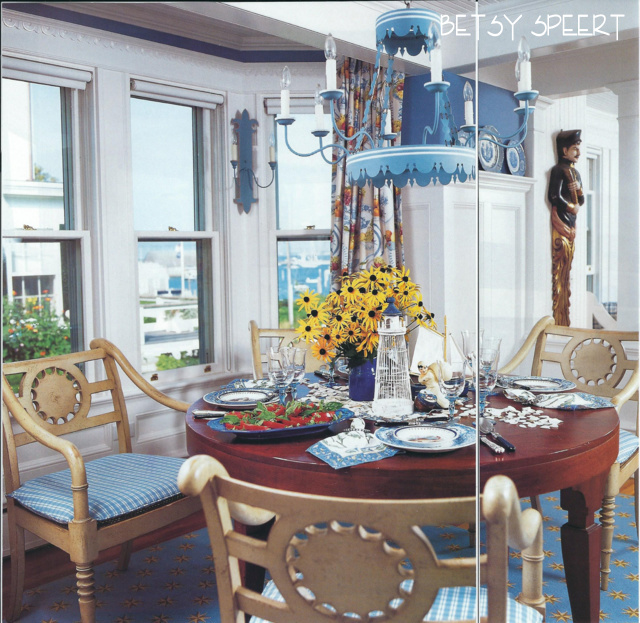 The sconces have changed as well as the window treatments to a more contemporary split bamboo roman shade. Below is my work in the dining room. 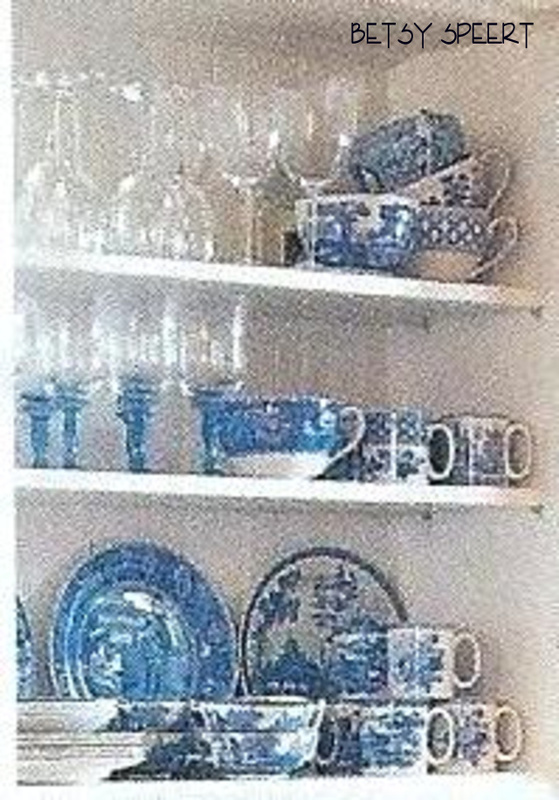 The walls were painted a simple blue as a backdrop for the toile plates we collected. It has a more current look with a seagrass rug ad bamboo Chippendale chairs that have a more mid-century vibe. They did keep the dining table and added it's leaf. 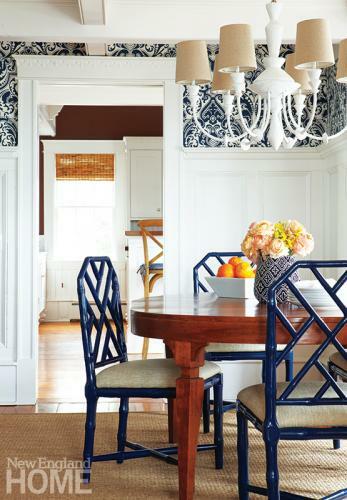 I love the blue and white wallpaper that looks so crisp next to the white woodwork. Instead of my patterned curtains, they have a simple white with a contrasting blue tape on the edge. The tole sconces have been swapped for polished nickel. I wonder if they kept the white oak server??????? next week...(or the week after.....) we will look at what I did to the little house behind this one that used to be a garage. I now have to fold my laundry as it's Sunday and LAUNDRY DAY!!!!! When I started to design the kitchen for Wynn and Catherine Newhouse, I needed to consider the challenges of barrier free design since Wynn used a wheel chair. One important aspect of this project was to create a home that Wynn could use without it looking institutional. I tried to incorporate the tweaks needed in a way that looked like they were just fun design elements. Since this was Wynn and Catherine's vacation home, I wanted the feeling of the cabinetry to be whimsical and countrified. 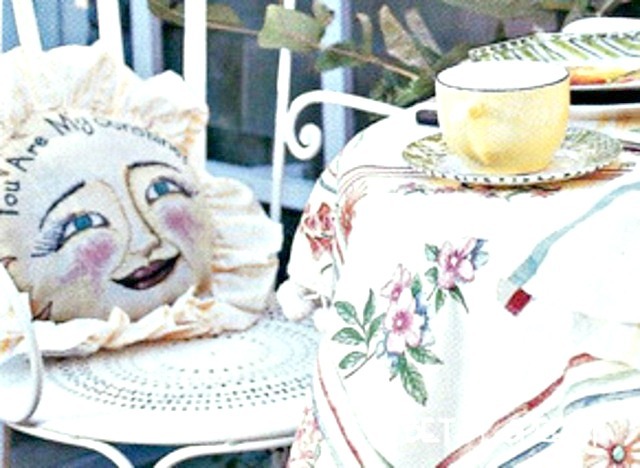 As Wynn's MS continued to attack his body, we needed laughter and joy to fill this home. He loved his toaster oven and made a BIG point of having a special easy access area for its residence. We found a simple country table that I set under the windows for just this purpose. In the magazine shot, we moved it for editorial reasons, but the function of that little table was for the TOASTER OVEN. Wynn was able to roll up to it and make his bagels with a schmear of cream cheese. 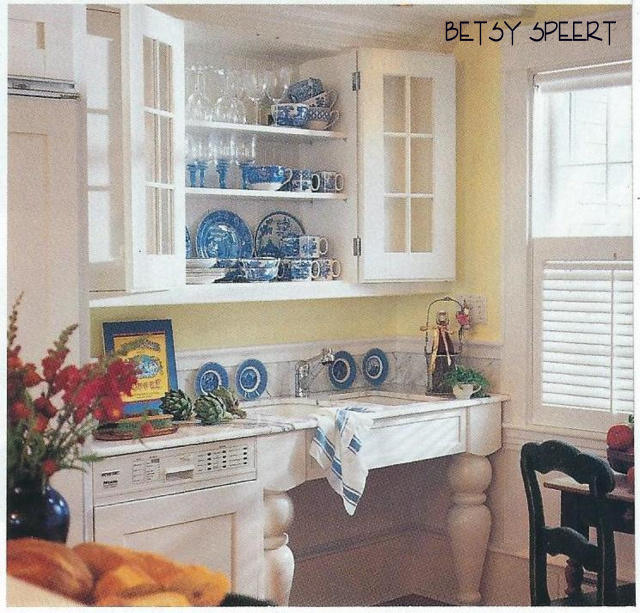 In the current owner's incarnation of this room, they've added another cabinet between the two windows. 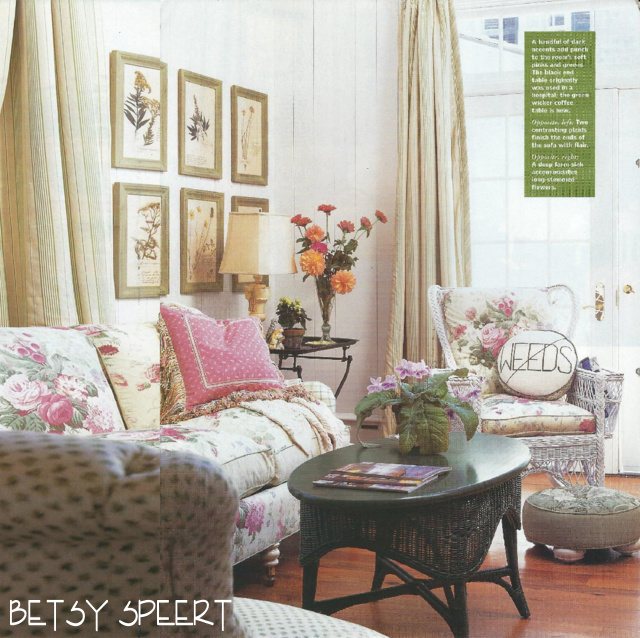 I got the picture of the current owner's rendition of the space from Vignette Design's blog. 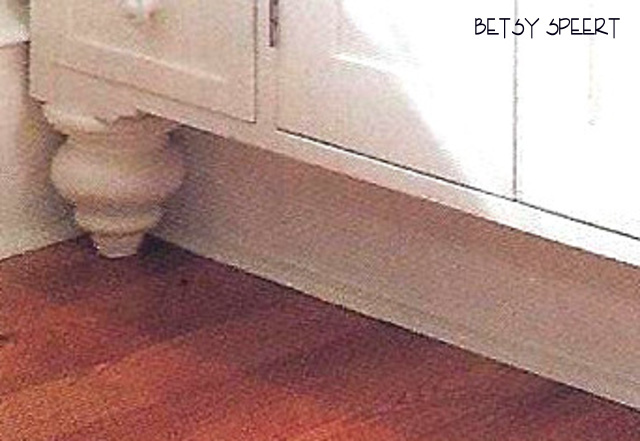 They've copied the legs of my cabinetry, but if you look closely, you can see that instead of creating a crown molding like the wall cabinets, they incorporated the window molding to wrap around the top of the cabinet, using my little half circle embellishment that I applied throughout the home. 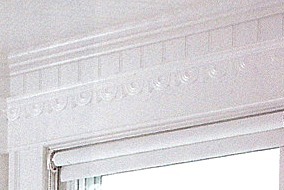 Here's a closeup of the detail on the windows. Boy!!! !I wish they had digital cameras back when I designed this home. I could have really shown the details up close and personal for you guys!!!!! 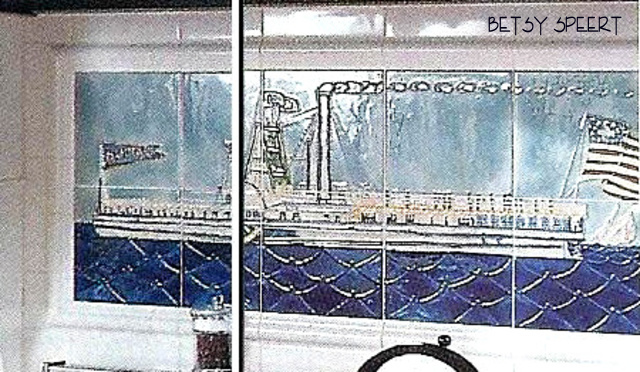 Over the stove I designed a tile backsplash of a steam boat. 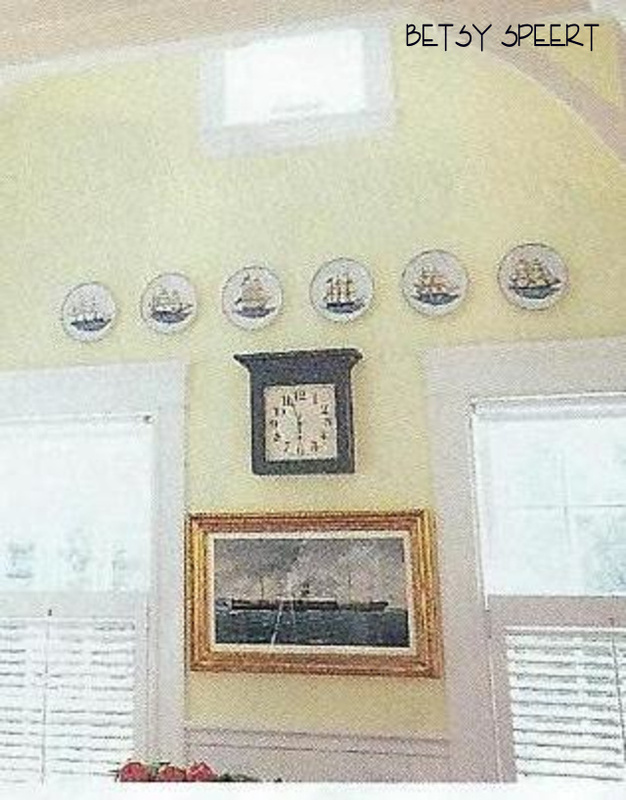 Wynn collected oil paintings of steam boats and we hung them all around the house, including one in the kitchen between the pair of windows. 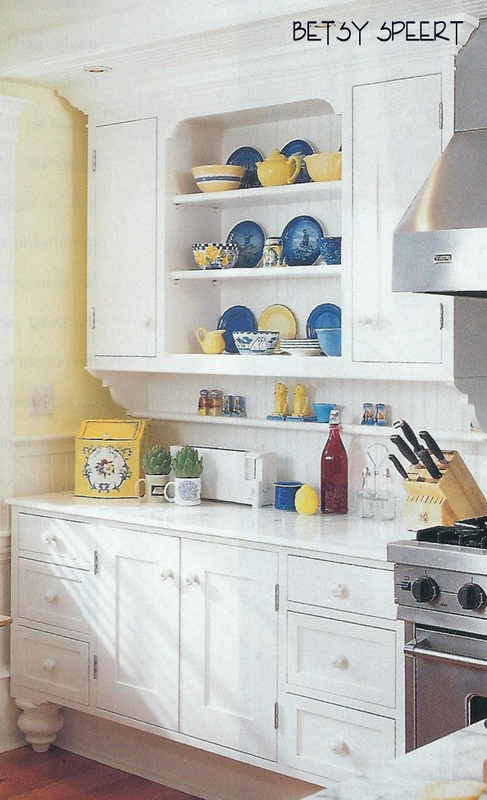 To the left of the stove was the largest cabinet in the kitchen. I wanted it to look like a freestanding hutch, so I added little brackets with a shelf for the splash of the piece, as well as making it all beadboard. This was eons before everyone started doing this.....just sayin'. So I did this design in 1994!!!!! Someone stick a fork in me.....I think I'm done. 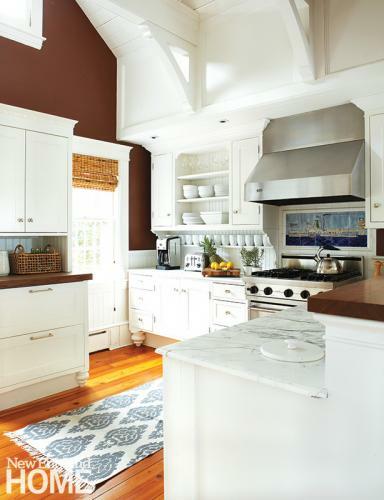 I used carrara marble for the countertops. I can't tell you the number of times I've had the stone guys I've bought from over the years tell me not to do this. I have some in my very own kitchen just waiting for me to stain it!!!!! I've had it for 11 years and it hasn't happened yet. It's got lots of rings you can see in the surface when the light hits it a certain way, but that's because I haven't resealed it in all the years I've had it. For the toekick, I measured how much room Wynn needed for his feet to fit under the cabinet. The toekick ended up being 8 inches high. To keep it from looking like a contemporary detail, I designed the big fat stubby legs to fit on either side of the piece. The current owners painted the kitchen a deep chocolate brown that contrasts nicely with all the white cabinetry. 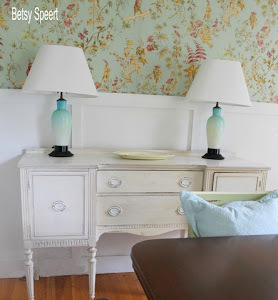 I had painted it a buttery yellow for a cheerful light and airy feel. 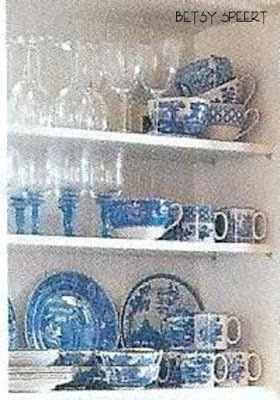 Over the sink we stored the blue and white china we found to go with the house. 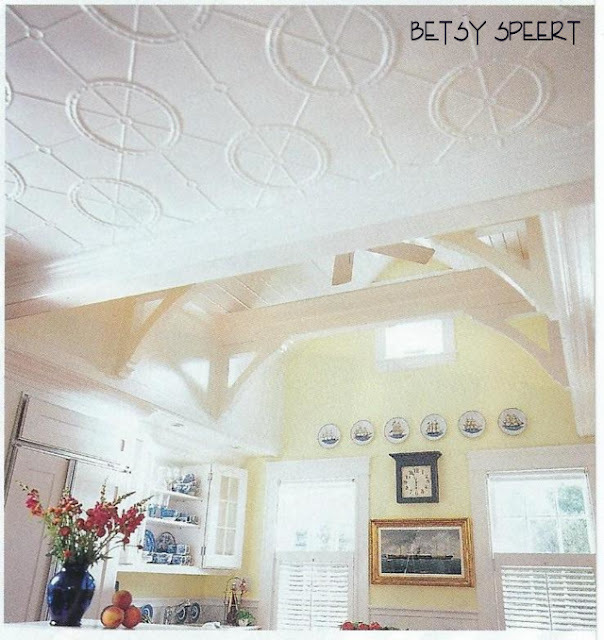 In the shot below, you can get the overall feeling of the room with it's cathedral wooden ceiling and beamed structure. I filled the wall with stuff! This was the oil painting of a steamship I had mentioned earlier. I had to have plates on the wall. 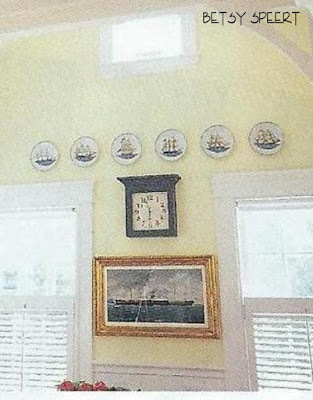 Catherine had collected these ship plates, so I felt they would just be great to continue the nautical theme. 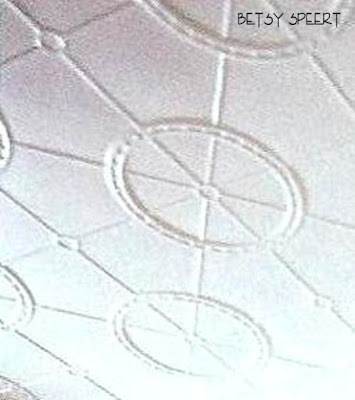 I had seen a picture in a magazine of a wonderful circle pattern in a tin ceiling. I couldn't find it, so I set my trust architect, Les Brown, to hunt it down. I don't know how he did it, but he found it. I love it for a couple of reasons. and it had a nautical feel to it that I just loved!!!!! 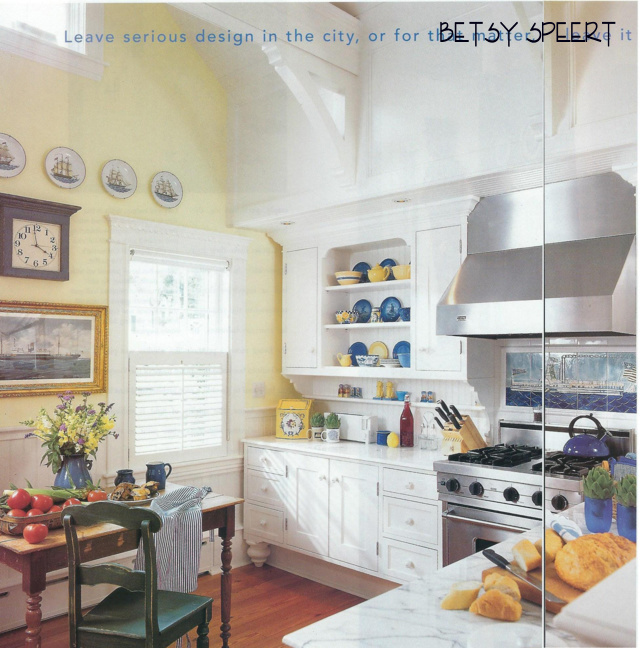 I still remember the late afternoon when Les and I were working on the design of this kitchen. He used to come over to my home/office/sweatshop and work with me at the drafting board. He never brought his own pencil, so we were always fighting over who got to draw. He chose these big brackets, and I remember it so clearly. I had no idea that they were so large, not looking at the dimensions in the catalog he had brought. They just looked really plain and boring. I learned an architectural lesson that I still use to this day. The scale of the brackets just blew me away. I need to get back to my fabric design. I just need to create one more pattern, and we can launch in the spring. Then we moved it to the fall, now we are aiming more realistically for this spring. So I'm sorry if some of you were expecting to get them through this website. But when they launch, I will be showing them to you all. just right for adding some toss pillows to the room for a punch of ME!